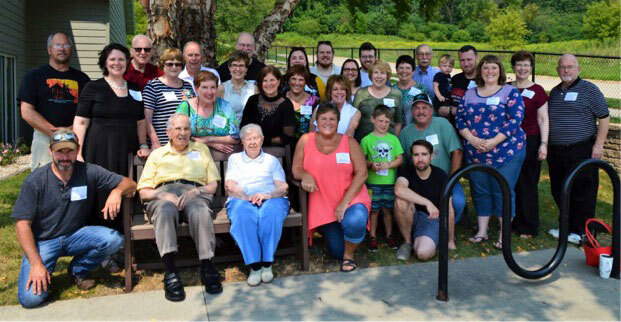 The second Pfister family reunion was held in Decorah Saturday, Aug. 11, 2018. Family came from five states, from Illinois to Idaho. The oldest family member was Gordon Pfister, 88, youngest son of Alwin and Caroline Pfister; the youngest was Liam Pfister, 1½, youngest son of Adam and Sarah Pfister. As part of the family activities, the family traveled to the Harmony area to locate the historical homes of the Burmeisters and the Norwegian side of the family, the Wilsons and Olsens. The visit included a stop at the former Big Spring Lutheran Church and Cemetery which the Burmeisters helped to found, a drive through the farmlands once owned by family and a stop at Greenfield Lutheran Church and Cemetery which the Norwegian branch of the family had helped to found. Everyone enjoyed visiting, games and sharing information. The family is now awaiting the publication of The Pfisters: Our Family’s Journey, the history of the family in northeastern Iowa and connection to southeastern Minnesota, in the near future.